Frugal & Natural Pest Control: Fruit Flies & Ants Be Gone! Unfortunately, it’s really easy to bring fruit flies home with the fruit you buy at the grocery store or farmers market. You can also bring them in from the garden. Overly ripe fruit is one of a fruit fly’s favorite meals, and they never eat alone. They bring all of their fruit fly buddies with them. This is Lindsay’s simple fruit fly trap. I’ve used this method and it really does work. I have a stash of empty, old pickle jars and use a few of them for projects like this. I also add about a tablespoon of dishwashing soap to the other ingredients that Lindsay uses. If you have fruit flies in particular, this is an excellent method. 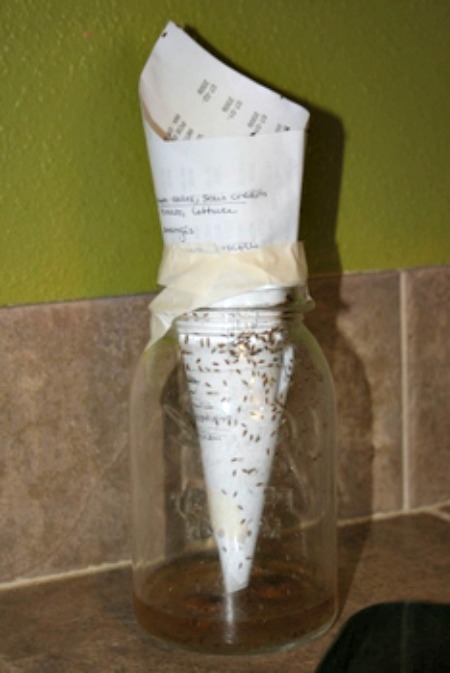 Click on the Frugal & Natural Pest Control: Fruit Flies & Ants Be Gone! link below to see the simple tutorial. Filed Under: Cleaning, Health Tagged With: Frugal & Natural Pest Control, Fruit Flies & Ants Be Gone!